At the end of September Chuck and I went for a short stay along the mid-coast of Maine. We love it so much here that we hate to leave. 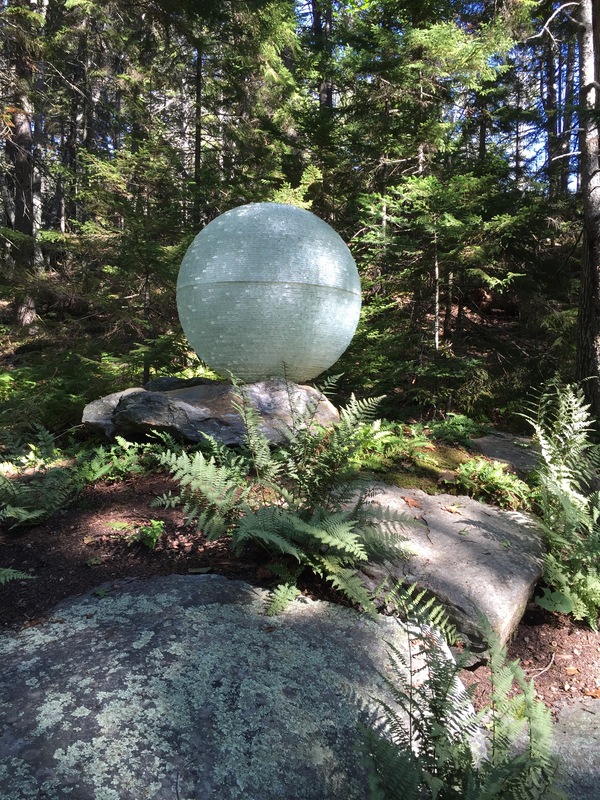 We started our visit at the Botanical Gardens in Boothbay Harbor. It is a very special place with beautiful plants, trees and views. 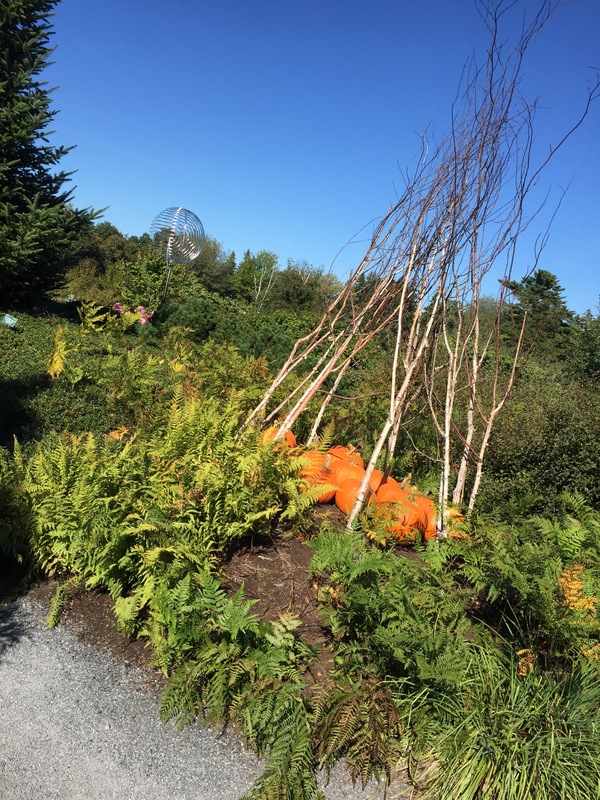 We love to go to the gardens, Spring, Summer and Fall – it is always beautiful. We walked the trails and took notes on what we might want to add to our gardens — it is nice to go at all different times of the growing season to see what is blooming. I like to have gardens that have blooms from late May until the first frost. I also like to see different types of plants that I may not have seen in bloom – it makes it easier to decide what to plant and where. The next day we took the ferry out to Mohegan Island. 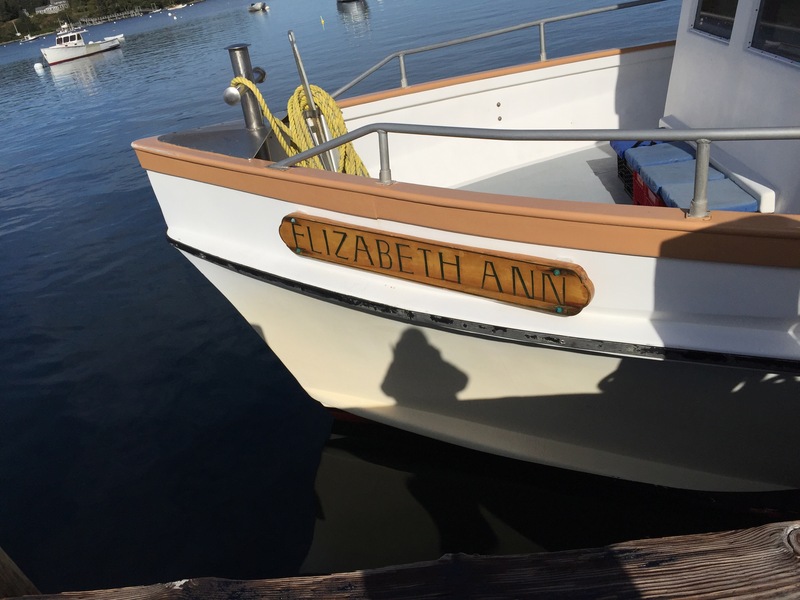 The name of the Ferry was the Elizabeth Ann which was perfect because that is our daughters name. It was an absolutely beautiful day. 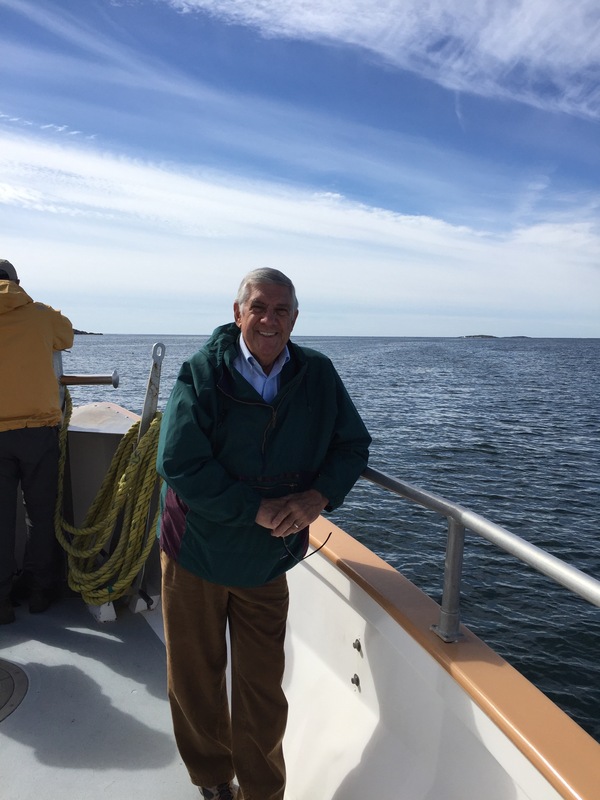 It was a wonderful trip out to the island – the sun was shining, the seas were calm and the air was just the right temperature. 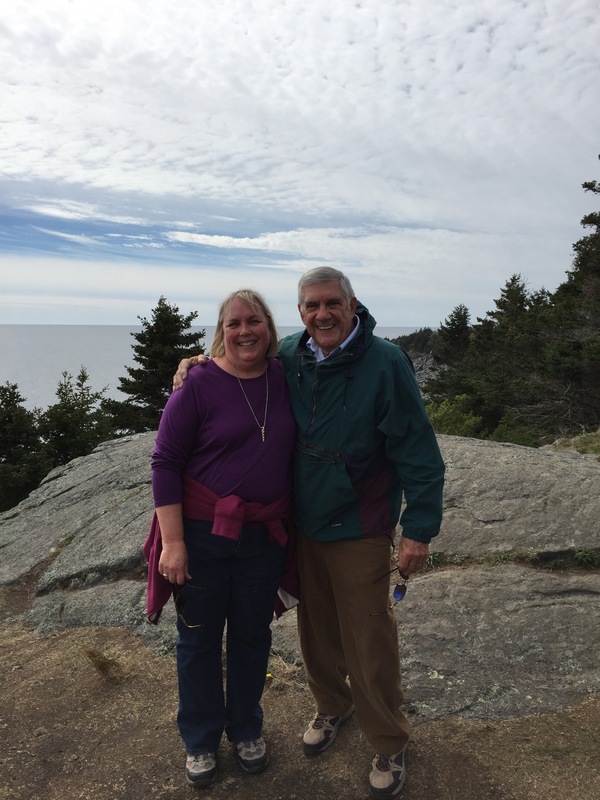 We wandered around the island – took a short hike and ended up at the Mohegan Brewing Company. We had a very cold beer and sat outside in the sun visiting with some of the other patrons. As is turns out 2 of the people we were talking to were from the same area in NY as we were. 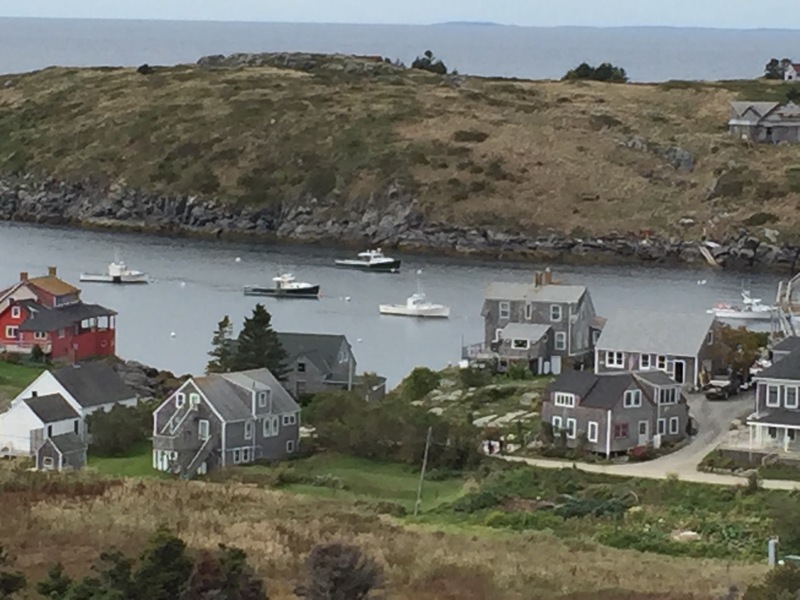 We discussed how small a world it is and the coincidence of meeting people who lived and worked right around the corner from us in NY, while having a beer 12 miles off the mainland on a small island in Maine. 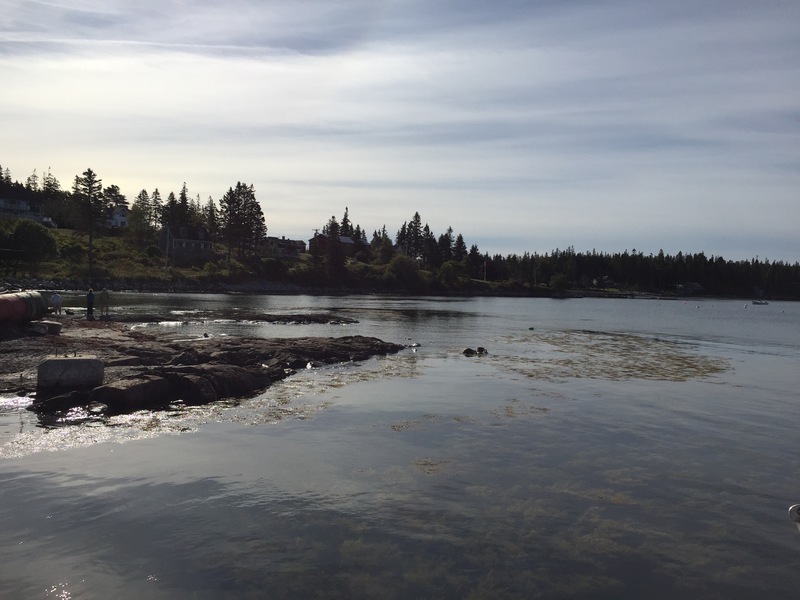 Mohegan Island has 75 year round residents – they seem to be an independent brunch who like to live life with out the frills of the mainland. I am not sure that I could live so removed from the rest of civilization but I would sort of like to try. If not for an extended period of time, at least for a short stay. I could sort of imagine spending my days making quilts, spinning yarn, reading great books and cooking wonderful hearty meals. I might add this adventure to my bucket list. Hmmm thinking…. 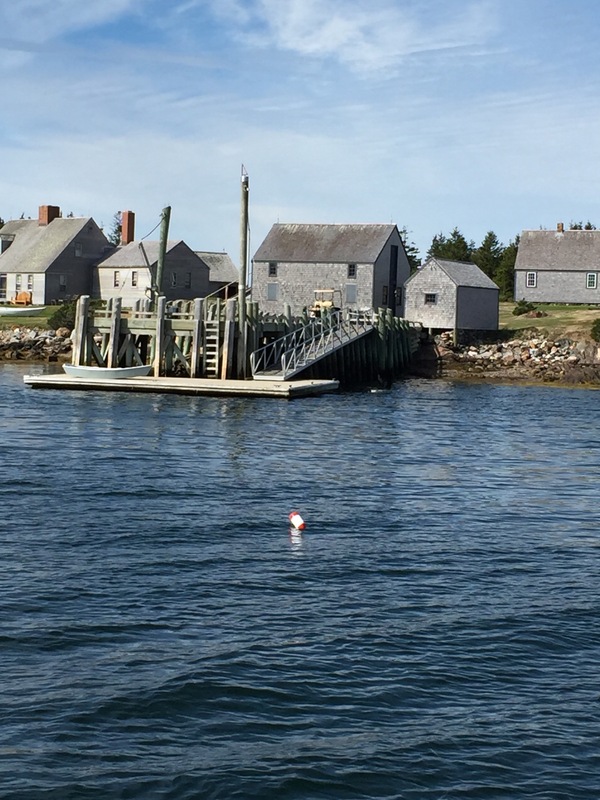 On the way home from the island Chuck and I sat right beneath the pilot house. 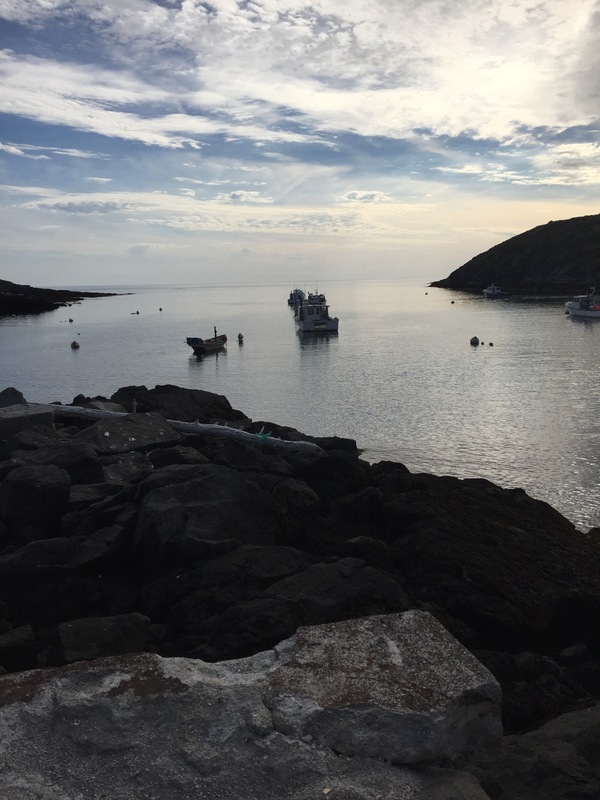 The view was so peaceful and beautiful – we saw a whale cut in front of the boat and move off to the port side. I had never seen a whale before and have always wanted to go on a whale watch. Imagine my joy when I saw that amazing animal right in front of me. It was a great day and a wonderful mini adventure. Since I have gotten home I have been working on quilts. I sent two quilts off to a wonderful organization that provides quilts to kids in hospitals and abusive situations. The groups name is Quilts for Kids. www.quiltsforkids.org – if you are interested in the group check out the website and if you can’t make a quilt you can always send a donation. 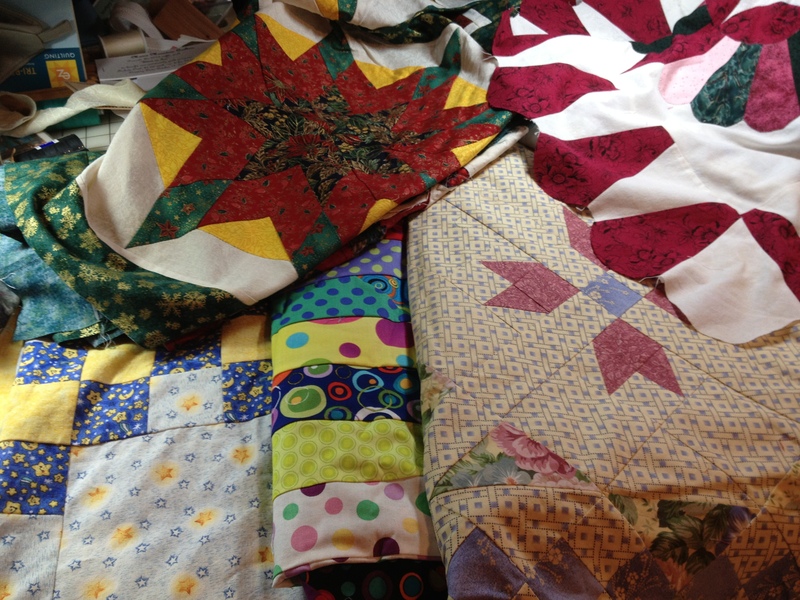 Several other quilts that are gifts have been made and there are several more in the works. Enjoy the wonderful weather that we are having. and after the damp cold spring and long snowy winter that is a wonderful thing. It will require practically daily dusting to remove the pollen that is coming in with the fresh air from all of the surfaces in the house but it is worth it. Summer officially starts in 5 days but in my mind as soon as I can leave the windows open summer is here. 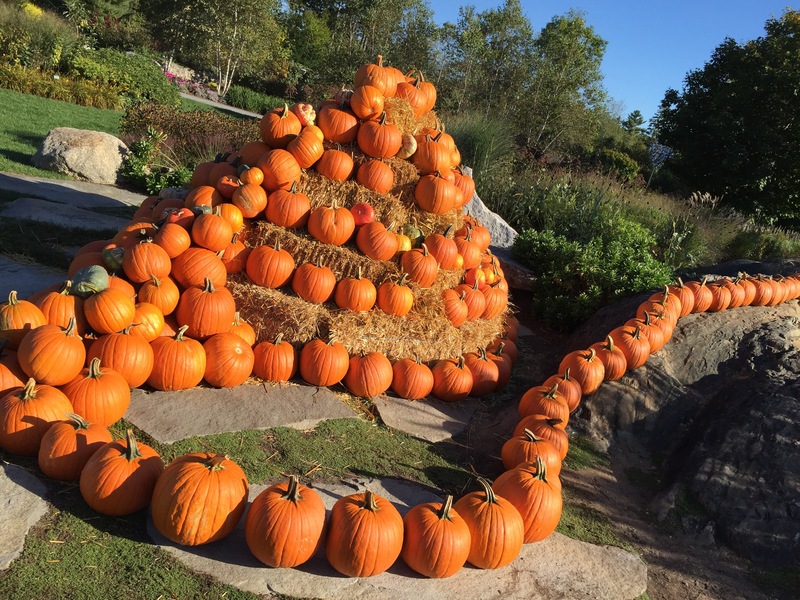 I love this time of year – well, lets be honest I love every time of year. I love all of the seasons for different reasons but that is a topic for another day. Today is about how everything looks bright and fresh and happy outside right now. 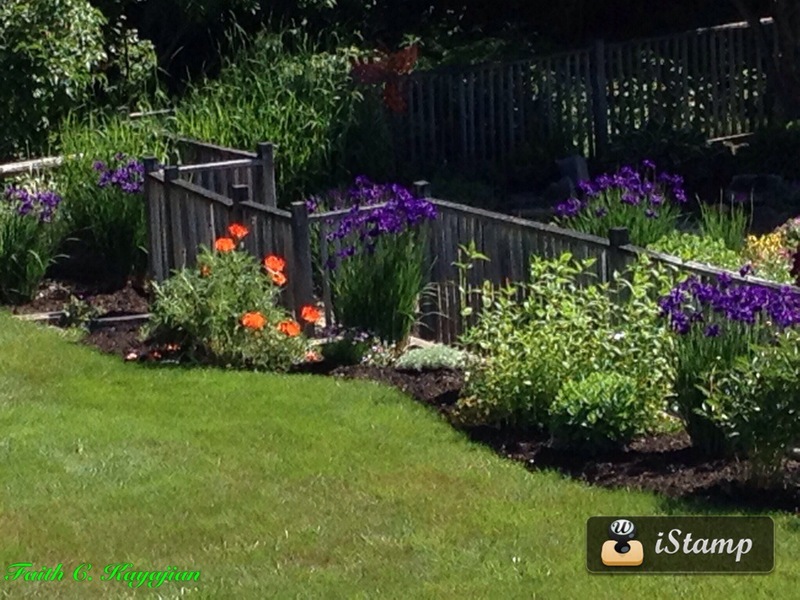 I love the poppies and the irises, I love that the peonies will be blooming shortly. I love the blue skies and the big puffy clouds. This past Sunday was fathers day. I had a nice phone conversation with my father. Chuck got 5 very nice phone calls from the “kids”. It was a sunny day and the weather was beautiful. We had a nice quite day. I have gotten a lot done the past few days. 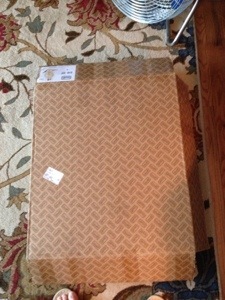 I am working on a new quilt – it will be a gift but I am pretty sure the recipient will not see is here. I got the pattern from the Missouri Star Quilting website. If you are looking for a new pattern you might want to check out this website – there are a lot of fun easy patterns. This is a picture of the blocks on my design wall – this is not the final layout just a peak at the finished blocks. I will move these around a lot before I decide on the finished quilt. It is so much easier to use a design wall than it is to crawl around on the floor. 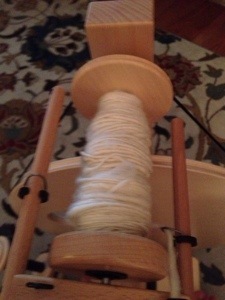 I have also been spinning again. I purchased some wonderful fiber from Weston Hill Farm – www.westonhillfarm.com – but I haven’t really started to spin that yet. It is so beautiful that I want to practice some more before I spin it. 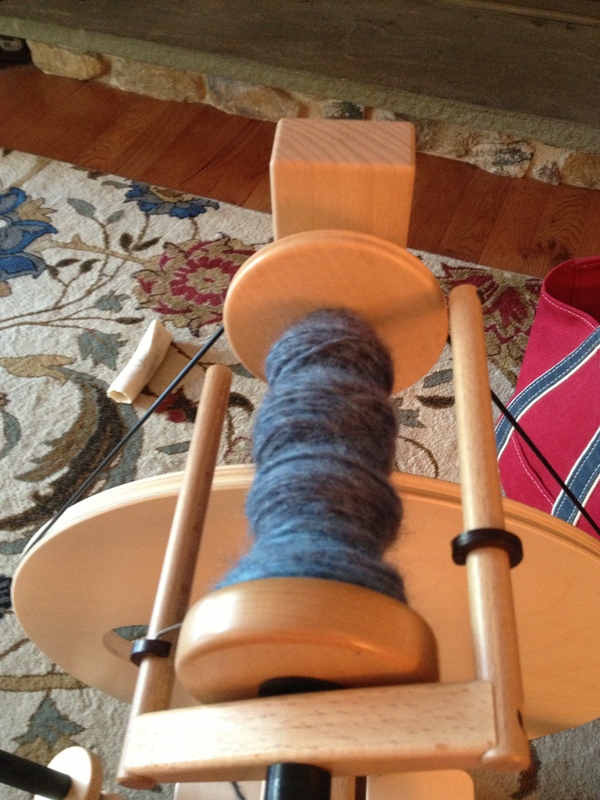 I have been spinning some fiber that I purchased at the Common Ground Fair last September. It is such a relaxing craft. I really enjoy it and I will have lots of wonderful yarn to knit when we hit the next season that I love. I also finished a penny rug this week. 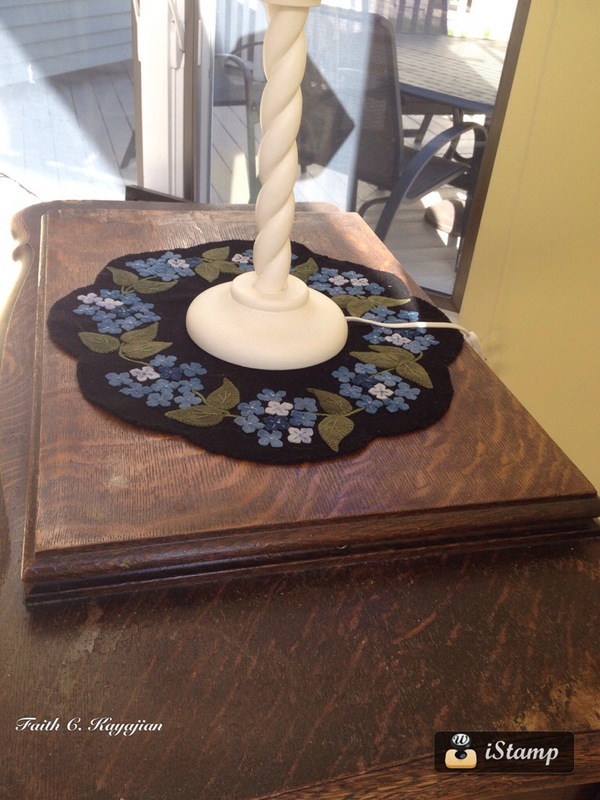 I have it sitting on top of my Treadle Sewing machine. I will probably not leave it there forever because the sun will fade it too much, but I like it there for now. 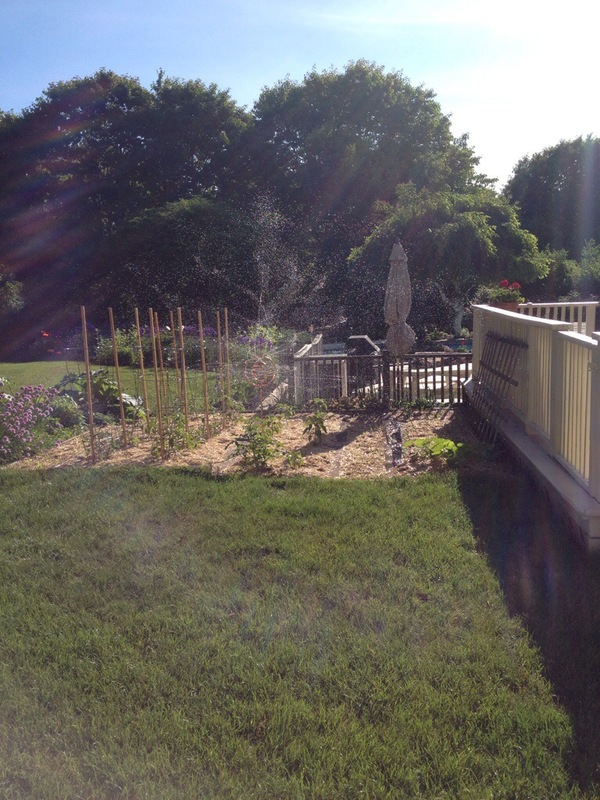 I am hoping that the weather stays nice so that my veggie garden does well. We are trying something new this year. We have black poly with straw over it covering the garden this year. Our hope is that this will cut down on weeds, hold the heat in the ground for the plants and help everything grow a little faster and bigger. I will let you know how it works. I hope you have a nice day and that you are able to enjoy the sunshine. 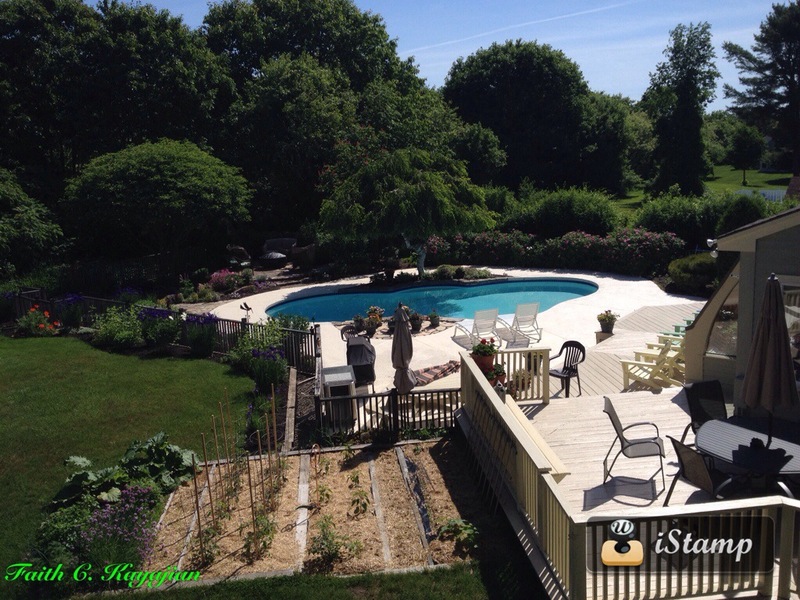 The weather is beautiful today – the next few days we have 80 degrees predicted and then rain. So I would rather be outside walking on the beach than working. But alas I need to work to continue with my creative habits. As I have mentioned before I purchased a spinning wheel. Oh the fun I am having!! I have worked with 4 different rovings since I brought my machine home. It is really amazing to see the difference in the yarns that I am spinning. I do see some improvement. I plied 2 strands of spun yarn to have a thicker yarn. The fiber that I was spinning had lots of variations in the color. I am really please with the results of the yarn – the variation in color reminds me of the ocean. This is the yarn after I spun the 2 strands together. Pretty cool don’t you think. I think this will be knitted into a Christmas present for someone who will remain nameless. So I will finish up this fiber that you see above and then I will dive into my quilting. I am going to promise myself that I will work on my quilting at least 2 hours every night. The way that I am talking it sounds like a punishment – it of course is not – I love to quilt and to make quilts but I am like a kid with an attention deficit problem – I keep flitting from project to project. Lots of fun flitting!!! 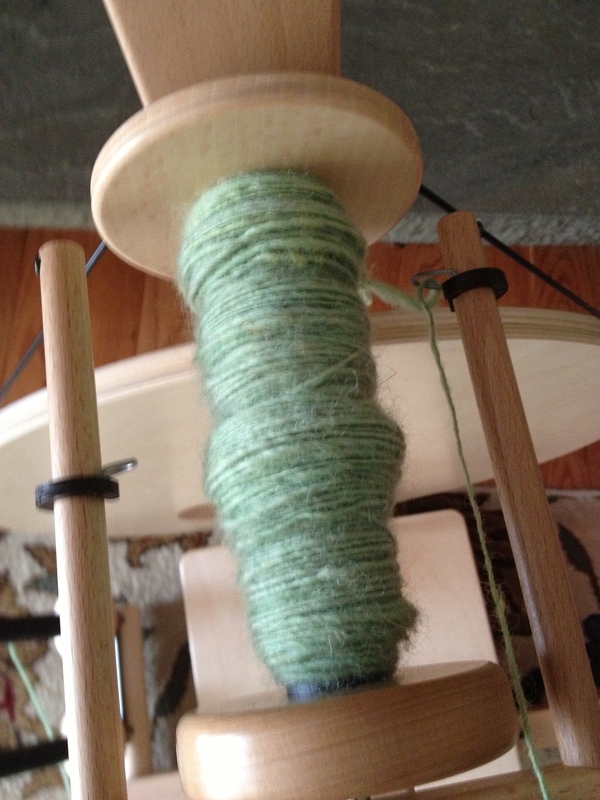 So my spinning is part of my distraction – the nice weather is part of my distraction – the desire to cook (because of the cooler weather) is part of the distraction. But as you can see by the photo at the top of the page there are quilts to be finished. 1 is a baby quilt, 2 are Christmas quilts that I have been working on for years, one is a mystery that needs to be marked for quilting and then quilted. Plus I have many other projects on my shelves waiting for my attention. I also have not mentioned the unfinished sweaters that are in the bags by my couch. Far too much to do and far too little time for it. There needs to be more time in the day, if only I didn’t need to sleep I would be getting much more done. Remember to let your creativity shine – it is fun and rewarding. My quilt guild has a UFO challenge every couple of years. This year I signed up to finish 4 quilts. 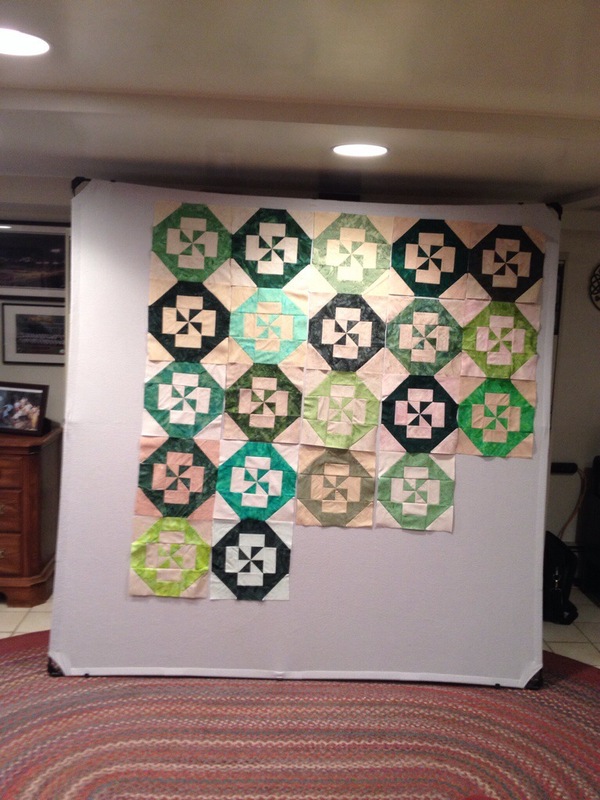 They are all pieced and only need to be quilted. Two of them have been UFO’s for over 10 years. 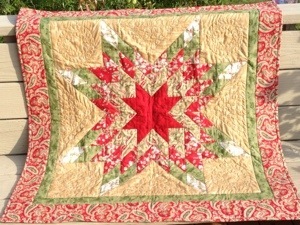 One is all hand pieced star blocks done in Christmas fabrics. I love the top and I need to find just the right long armed quilter to quilt it for me. The other one is a Dresden plate quilt block that is machine pieced and machine appliqued. Hopefully they will be done soon, but they will not be done by Monday when the UFO challenge is taking place. I did finish one of the quilts that I signed up to complete. I started this quilt my years ago at a quilt retreat in the Catskills. It was a wonderful retreat and a fun class. Part of what took me years to complete was the hand quilting. 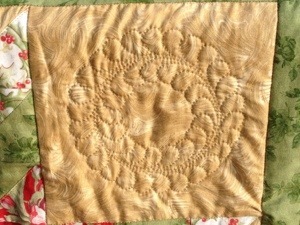 I quilted some feathers in the corners and along the edge. I machine quilted the rest of the quilt with metallic thread. It gives the quilt a little extra Christmas sparkle. This will either be used as a wall hanging or a table topper. For now it will be stored in a closet in a pillow case to keep the dust off of it, but come December it will be used to decorate as well as reminding me of a great fall weekend with friends. 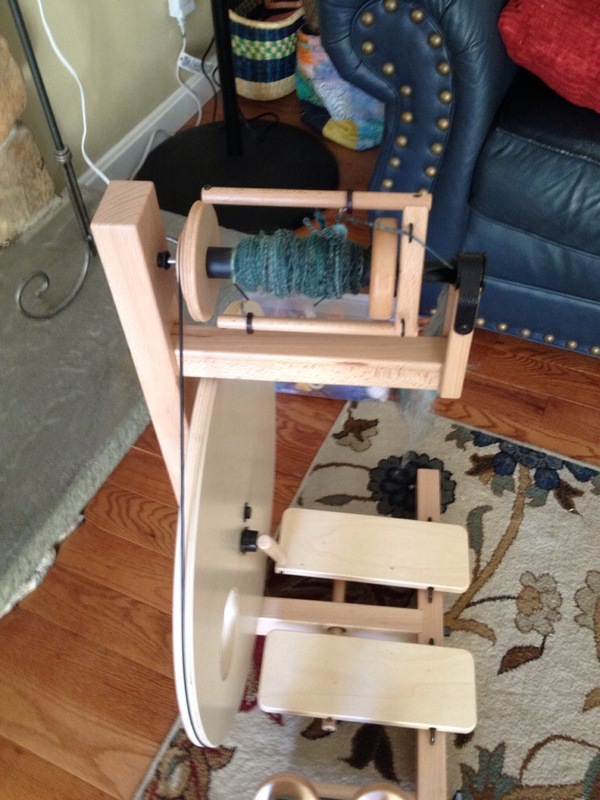 I have also been spinning yarn with my new spinning wheel. 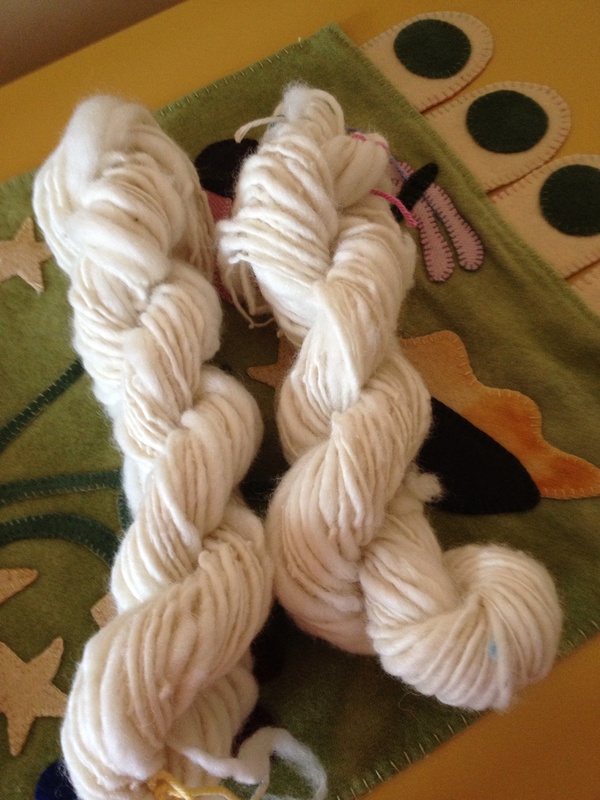 Here is a picture of the yarn that I have spun. I am happy with it. Not bad for a novice. I really love it and hope to, take a class soon to really learn what I am doing right and wrong. I have wanted a spinning wheel for about 25 years. I go to county fairs and I always go to the sheep barn and the Wool Nooks and watch the spinners spin. I have been looking for second hand spinning wheel for years with no luck. I have finally decided to bite the bullet and go buy one. 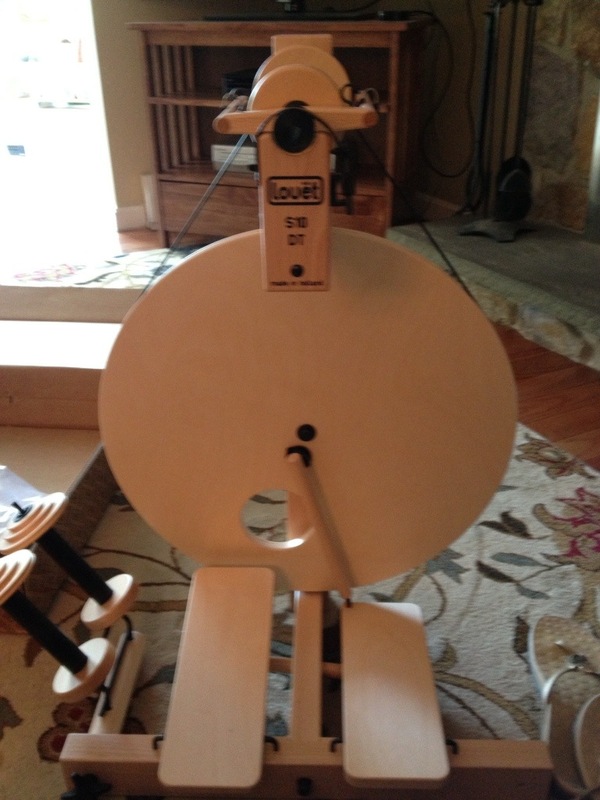 I purchased a Louet S10 double treadle. I bought it from a wonderful yarn and equipment shop in Bath, Maine called Halcyon Yarn. It is a shop that is full of amazing yarn, fiber, equipment for knitting, spinning and weaving. I could spend hours just browsing through this shop. 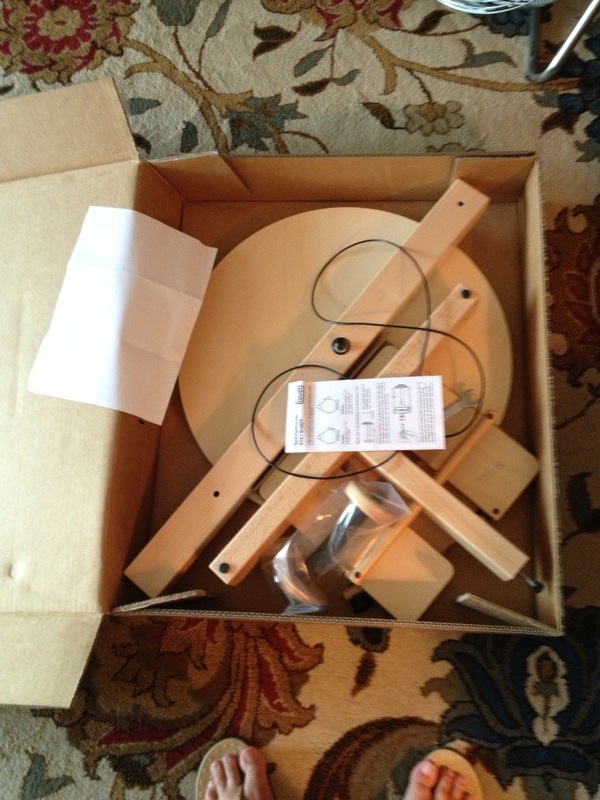 Then, like a little kid on Christmas I opened it and started to assemble it. I will be spinning a lot in the next few days. It is very relaxing and so far it is as wonderful as I thought it would be. 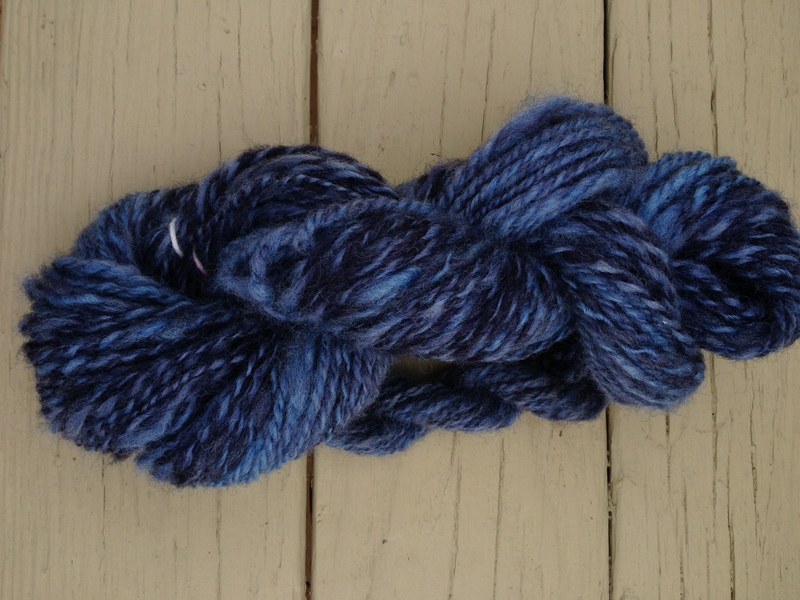 The potential for spinning beautiful yarn is huge. I don’t expect fabulous things at first but with practice I will figure this new skill out and enjoy it immensely. I need another hobby right??? Sometimes we have to be bold and just do it! That is the way that I feel about my new wheel. Maybe if I had a bucket list I would be able to check it off of the list. I know that it is a dream come true and something that I have been contemplating for many years. I will have fun, I will knit something fun with my handspun yarn and someone I love will receive it as a gift. Life is good!